hELLO! hOW'S YOUR WEEKEND GOING? oY ... don't you hate it when your cap locks is on when you don't want it to be? I started today's card earlier in the week and after the boys went to bed, I was able to finish it before the deadline for the current "Use an Animal" challenge at the famous Merry Monday Christmas Challenge. The stinkin' cute mouse, sediment, and Santa are all NBUS stamps from the super fun Paper Smooches set called "Santa Paws." You can't see it, but I liberally applied Wink of Stella to everything. The snowy hills are handdrawn and that reindeer is from Stampin' Up. If I need a hamster running the wheel in my head to help me focus, then I fingered for sure Santa needed his own hamster (or, in this case, a Christmouse) to help him keep everything straight, what with the ginormous lists of boys and girls and addresses and calories imbibed slurping the milk and munching the cookies ... Why I imagine if he didn't have a hamster/mouse he'd get all distracted and possibly stop off at a fly-in movie theater all night. That would not be good. You might ask what the deal is with the motley fur on Santa's hat. Well, he forgot to put his hat in the laundry, so Mrs. Claus had to pull an old one out of the donation box which had yellowed with age. Wait. What? The donation box had yellowed with age or the hat had yellowed with age? I wish I was better at parsnipping my sentences. 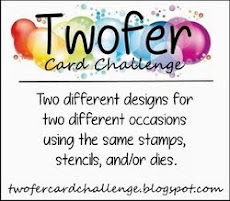 I used markers to color my card, so I'm entering the "Make Your Mark" challenge at Addicted to Stamps and More. 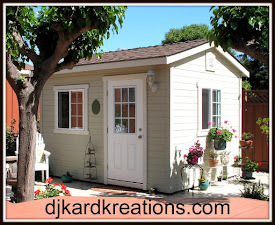 I was happy to see that Kim is continuing the anniversary celebration at Paper Smooches Blog with a "Fun and Cute" challenge. 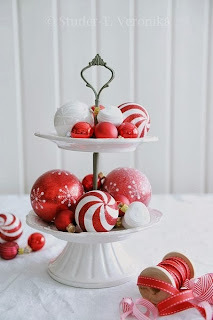 There's a lot of red and white on my card, so I'm linking up with the current challenge at Festive Fridays which is this beautiful photo inspiration. And, as so often happens, yet another Christmas challenge is currently featuring red, as in Rudolph The Red-Nosed Reindeer. 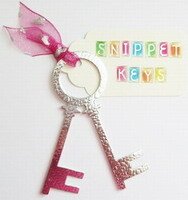 You can find it over at Jingle Belles! The little reindeer seen on my card photo-bombing Santa is obviously NOT Rudolph. He is the lesser-known, but impish, Ruben, who's claim to fame is his uncanny likeness to the adorable Katie Couric! I have two more new friends joining us today for you to meet. But first I want to take a second and thank those of you who do click on the links and make new friends with my friends! Shona Chambers of Twine Around. 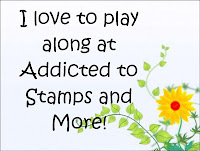 Shona has only been blogging since September 2013, but she has shared card-after-wonderful-card on her posts. 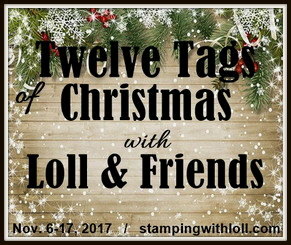 I love her style and I think you will, too, as you help me welcome her to this supportive stamping community! Sid of Harpies Crafty Corner. Sid is my second male follower and I'm so delighted about that! He has been blogging since 2006! Yes, another blogger who has been inspiring us for a very long time with his incredible spirit and works of card art! Welcome, Shona and Sid, and thank you for joining us!! Stamps The Alley Way Stamps "Santa Paws"
Awwwww!! This is too cute and super fun!!! The mouse looks as if he would be super helpful to santa!! This is just adorable :) gorgeous colouring too !!! This is so cute...so like you! Your posts always leave me in a fabulous mood...today is no exception! I love all the cute images you have combined to make such a fun card and the sentiment is fabulous too. This is sooo cute Darnell, love the mouse and the cute little reindeer sneeking in on the act. Your card is Wicked! which means fantastic here in the UK ... Welcome to Sid and Shona too! The photobombing reindeer just takes this right over the edge! LOL! And you're so right, Santa MUST have a hamster! Fabulous - Ruben definitely steals the show! What a cute little Santa card ... love the glittery sparkle ... so glad you went *red* with us at Jingle Belles. Super cute, Darnell! Love those adorable images and the fun greeting. It's nice to meet Ruben, too! Such a fun card Darnell, love the very square Santa and the Hamster, Ruben is adorable too. Thanks for sharing at Merry Monday. Love the googly eyes and the two animals - the whimsical feel of this is perfect for the holiday season! Thanks so much for joining us at Festive Friday! Darnell, your card and post brought a huge smile to my face this morning. LOVE it! The yellow hat, hahaha Thank you so much for joining us at Merry Monday! Hugs! Cute card Darnell and a fun post this morning, yellowed from storage hehe!! I think the photo bombing Reuben steals the show!! So cute, Darnell, and I'm thinking the mouse would be fine for a little elf. It is so so fun and cute! Love your Santa! And you are just too funny, love reading your posts! What a great combo of stamps to make this adorable card! Super cute. Ruben and Katie Couric - lol :o) Thanks so much for joining us at ATS&M. Oh Darnell, I love all the cute images you have combined to make the adorable fun card and the sentiment. The impish, Ruben is perfect. Cute and adorable, Darnell, as always. Hope you are having a great weekend! Now this is the cutest card ever - my fav part is that photobombing reindeer :) (or is the mouse, or maybe the googlie eyes, or . . .)!! This is so cute love the image great card. Well, what a wonderful surprise I got this morning to find such fantastic comments on my blog. Thank you so much!! It was such a lovely thing for you to do, to welcome me into the 'world of card makers' and let people know about my blog. Have found the craft/blog community so welcoming and so supportive. I think its wonderful how you mention other bloggers on your post. I think I will start doing the same so I can pass on the 'crafting love'! And love the Xmas card, santa is so gorgeous with his googly eyes. Will have to practice my colouring as it really adds so much to your card! Too fun and cute! Love the tiny reindeer poking his head up from behind the hill!! Loving Santa's little google eyes! This totally made me laugh! What an adorable scene you created here! And I also wanted to say yay for you on winning one of those PTI credits! Hope you were able to get some great stuff! Well you have me laughing and that is a good thing!! Wonderfully cute Christmas card and I do love mice!!!!! You and your hamster have done a fantabulous job with all these challenges! Love those eyes! Thanks for sharing it with us at Merry Monday! googly giggly goofy fun.I love Ruben popping up behind the snow drifts. No snow today...yea! gah, sooooo cute! Your comment about katie couric made me chuckle! Santa's Hamster?? I though this was a mouse!!!!! jUST - um, I mean Just how do you manage to incorporate so many challenges into one card - you're amazing! Love this sweet little scene! That little Ruben is adorable!!! And as far as I'm concerned you can never go wrong with PS! Fab card, Darnell! I hate to say it, Darnell, but Santa looks like SpongeBob in disguise to me. I love that his google eyes fit perfectly in the glasses. And the photo bombing reindeer is the cutest. Wonderful card, love the image and the super cute little reindeer. This is absolutely gorgeous with a capital C for Cute! Love it and that cheeky reindeer - what is he like for getting in on the picture! Darnell, this is just too stinkin' cute! I love that Santa and that adorable mouse sitting on his head is just too much fun! Is that a little reindeer trying to photo bomb Santa's photo op??? too funny! Fun, fun, fun! Especially photo-bombing Ruben is too adorable! Hi Darnell! How cute! I had to check the date several times as I thought I had found an Xmas post. You can tell I am not a stamper or card maker, right? The mouse is GREAT on top of Santa's hat, which didn't look yellowed at all. And that reindeer was too darling. Your narrative surrounding the card just made it all the better! Hugs! This card just makes me smile. I love the googly eyes and yellow hat, too! The reindeer makes the card. Just love it! What a cute and funny card Darnell. Love your little story about the Santa hat! 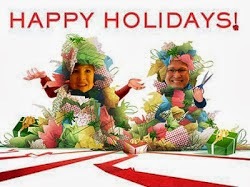 Thanks for playing Merry Monday this week! I try to support challenges but I need to clone myself to do all the ones I want to do... or stop visiting all my wonderful pals in Blogland. And Ruben! I do see the resemblance to Katie Couric (who?). As for Santa and his out of date hat... I think he needs to back away from the caffeine for a little bit. Just sayin'! What a fun card, Darnell! I love the images you used! Too cute! Adorable…. yes, that mouse is too stinking cute! Love the entire card. Love your one-layer Santa guy with his Christmouse running a top his head! Great hills you made too. Super-cute, Darnell! You really make me chuckle with your post hun!! Anyhoo i hope you are well! This card is adorable!! I love the photo bombing reindeer!!! You lucky girl! SO happy to see you as the winner at Paper Smooches! Such a darling card! And in case you haven't seen it yet, this card was a winner at PS. Congrats! This is such a fun card Darnell, I love your Santa image with the adorable mouse sitting on his head, who wouldn't love to receive this at Christmas. This is sweet and fun! Darling image!!! Another entertaining post! Funny thing is....Ruben was the first thing I noticed when I glanced at your card! Totally fun! Love Santa's somewhat seasoned hat and his googly eyes! Awesome wee highlights in his hat & pants! ...but the mouse steals the show! Ya-hoooo for the win at PS with this sweet card too!!! This is the cutest Santa, I have ever scene and that little mouse over is head is just adorable, loved ur coloring :) thank you for sharing with ATSM!! Been having a look back as I have missed so much...busy with wedding cake at present, so sugar flowers have overtaken cards at present, be back on track soon. Tee hee Darnell .. .. loving Santa's googlie (is that how you spell it??!?!) eyes!! Hamster, mouse. It's all good! I think Mrs. Claus hit the eggnog too heavily and forgot to do the laundry, is what I'm thinking! LOL! Super cute card, Darnell!! Cute image. Great coloring. Love Reuben the reindeer too. I love this adorable card! that Santa and reindeer are so cute! My stray little finger hits the caps lock all the time and I find myself SHOUTING! It's mildly irritating but my own fault for not being able to control my digits! Oh, Darnell--this is so incredibly cute. I love it. The google eyes are the perfect touch! Thanks so much for playing with us at Festive Friday! Oh, what an adorable card, Darnell! I love how you created your scene...so charming and so CAS! Not to be 'out-done' by your description, though! You totally crack me up...honestly! And, I love how you managed to squeeze it into 4 challenges, too...you're so clever! Oh, how cute, Darnell...love how that little mouse is looking right up at the sentiment! And...it's nice to know Santa and the first lady of Christmas don't ALWAYS have their shtuff together!! !Great to have you and this cheery creation at Festive Friday!! !